amiitmishra, 20 May 2012I will be getting my N9 64GB in next 2-3 days. I decided to buy it after so many research and ... morehey congrats, m from India too with n9 64gb. 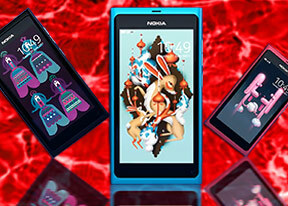 But please b aware that some fake n9 are also available on ebay, so do some proper research before buying. I bought mine from dubai. Its really a nice app for people like me who forget to silent phones while going to class or forget to set it back to ringing. It has too many features. Good to hear that N9s of both of you is safe..it has a good build quality for which Nokia is also famous foR :d..
AnonD-49722, 19 May 2012do you mean me??? hahahahaYes my friend. hehehe. do you know what i just doing? AnonD-34077, 18 May 2012I have black and I like it. Also someone here has Cyan but he does not like it. Go for black b... moredo you mean me??? i was happy to read that whatsup app is available for N9 but i heard its also possible to down load it in N900 as well. but when i tried to do so i got a message saying this application cant be download because some missing eliments!! any one knows if its possible to down load the latest whatsup version to N900? can you capture photo using the front facing camera? or is it just used for video calling? Guys you can ask for applications there in this section.please read the guide before posting. AnonD-23701, 18 May 2012So we are from the same city .. Nice...I live in Lahore for studies. I'm from Bahawalpur .